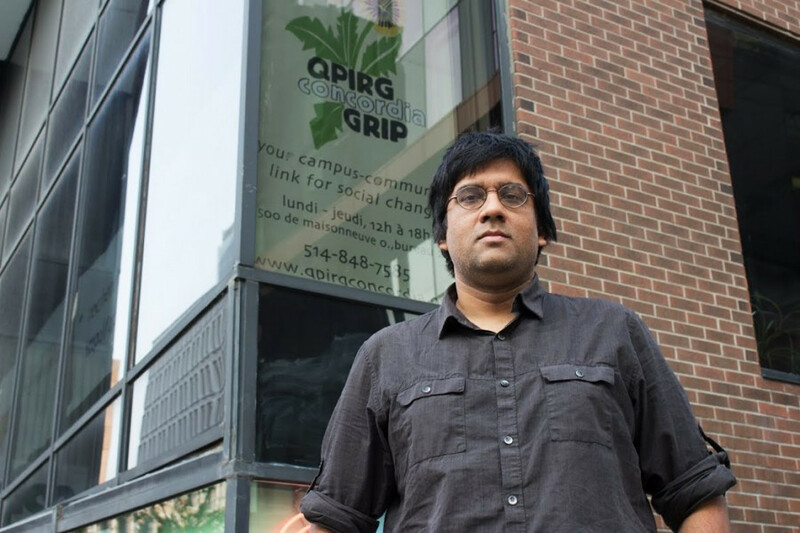 Activist Jaggi Singh, who also works as a researcher for QPIRG Concordia, pleaded not guilty this morning in Quebec City municipal court. Archives, photo by Matt D’Amours. Activist Jaggi Singh pleaded not guilty to charges of impersonation and obstruction of justice in Quebec City municipal court Wednesday morning. He has since been released on conditions that include staying away from the National Assembly, keeping the peace, and paying a $250 bail. Last update at 7:06 p.m. The charges are in connection with his activities during anti-fascist counter protests on Aug. 20, where after being detained, Singh jokingly identified himself to police officers as Michel Goulet—a former left-winger for the Quebec Nordiques. Singh, who also works as a researcher for the Quebec Public Interest Research Group at Concordia, was arrested Tuesday morning and represented himself in court. A crowd of about 20 people also came outside to show their support and protest against the charges. Crown prosecutor Marie-Hélène Guillemette was initially against his release Wednesday morning, but later decided to release him on a number of conditions. One condition asked that he be fingerprinted, but Singh opposed this and through negotiation was able to have that condition dropped. A condition to not allow Singh in the Quebec City region was also renegotiated to only apply for the area around the National Assembly. “It’s ludicrous, nobody actually believed I was impersonating him. It was a joke. But they used all of that to inconvenience me for two days,” said Singh over the phone Wednesday evening. On Aug. 20, hundreds of counter-protesters gathered around Quebec City’s National Assembly in an attempt to push the far-right group La Meute out of the city. La Meute had made plans to protest against the influx of migrants crossing the border into Quebec that day. Some counter-protesters marching against La Meute used a number of violent tactics, and vandalised the city. Some of those acts were committed by masked individuals who allegedly came from Montreal. Singh helped organize the Montreal contingent, though he insists that it’s unfair to identify him as the sole leader of any particular group. Singh also argues that the whole thing has been blown out of proportion. Singh will make his next court appearance on Sept. 6. He says he plans to represent himself again, and says he’ll be filing a “very detailed” disclosure request against the Quebec City police. Quebec City police also said in court on Wednesday that those who participated in a section of the protest that they had declared illegal could face arrest for the various acts they committed.